Aloe vera is a stemless plant growing to 60–100 cm. The leaves are thick and fleshy, green in colour. These species has been widely cultivated throughout the world. It also can be grown in pots. 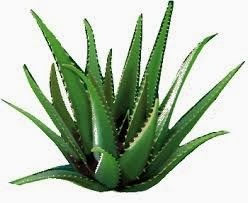 Aloe vera is used on facial tissues as a moisturiser and/or anti-irritant to reduce chafing of the nose. Cosmetic companies commonly add sap or other derivatives from Aloe vera to products such as makeup, tissues, moisturizers, soaps, sunscreens, incense, shaving cream, or shampoos. Aloe vera gel is very good for treating sunburns, healing cuts and wounds, dermatitis and also insect bites. The best part is that this plant can be consumed and also applied externally. Aloe is great for maintaining cholesterol levels by reducing tryglycerides. Aloe vera is good for diabetes patients, because it helps regulate blood sugar levels and the ability to reverse blood stickiness, thus ensuring smooth circulation of blood. The anti-ageing properties of aloe vera moisturizes the skin, gets rid of dead skin cells along with wrinkles and fine lines. Aloe Helps to improve digestion. Make juice out of jelly leaf and have it will improve digestion.